Under the brand names PARKY® Barriers and URBANY® City Projects we design, manufacture and distribute car barriers for car parks and bike-racks - to be fitted on private areas closed to public transit. The brand name ARC Rubber identifies a range of products for road practicability and street furniture, made of rubber from recycling of worn-out tyres. The PARKY® and URBANY® projects have been conceived with the intention of combining design and high technology with the traditional functional character of the products. The core of this evolution are the original caps with rounded nice shapes, made of hi-tech materials, very resistant. 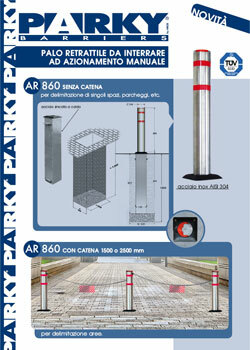 The PARKY® range consists of different models of car barriers / posts / poles in order to best meet various requirements. Every item of the PARKY® range is TÜV certified. The URBANY® range consists of bike-racks either already assembled or in kit to be assembled, also with the possibility of modular fitting and with cycle places at staggered heights for space optimization. The ARC Rubber range consists of bollards and wheel stoppers processed with respect for the environment.